Monday, April 18: Fred Urie found Louisiana Waterthrush, Pine and Palm Warblers in Ojibway Park this morning. Saturday's birding trip tp Point Pelee recorded over 70 species of birds as well as several butterflies (Spring Azure, Eastern Comma, Mourning Cloak, Red Admiral, Cabbage White). Bird highlights at the tip included King Eider, 50 Horned Grebes, 24 Long-tailed Ducks, White-winged Scoter, Black Scoter and over 400 Surf Scoters. Other migrants seen Saturday included Yellow-bellied Sapsucker, 25 Northern Flickers, Eastern Phoebe, Purple Martin, Barn Swallow, Brown Creepers, Hermit Thrushes, Eastern Towhee, Field Sparrows and Savannah Sparrows. The Hillman Marsh shorebird cell held 45 Golden Plovers, 2 Greater Yellowlegs, Dunlin and a nice variety of waterfowl. A male Wild Turkey was spotted across the road from the nature centre on April 10. Wednesday, April 6: Two prescibed burns were carried out today. 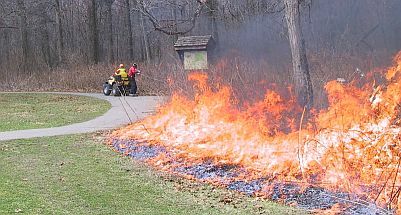 A 53 acre portion of Ojibway Park and 22 acre portion of Black Oak Heritage Park were burned to help maintain open oak woodland and savanna. Without periodic fire this endangered ecosystem would be lost. While out on the burn lines we saw our first Common Green Darner dragonflies of the spring. Tuesday, April 5: The first singing American Toads were heard this evening. There were also many Chorus Frogs and American Woodcock calling on this warm night. Copyright © 2005. All rights reserved. You are on a City of Windsor Web Site.